Winner of the Pro Audio Review Excellence Award. 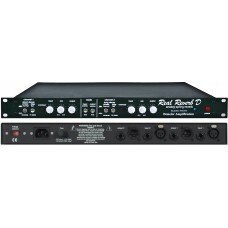 For the first time in over ten years, a high quality real spring reverb is available for professional sound recording. The RV-1 Real Reverb employs innovative new circuit technology with two Accutronics, classic, full-size, 6 spring reverb tanks. The result is all the great sound of analog reverb without the problems usually associated with them. The unit features two channels, each with its own reverb tank. Channel one has a short decay time and channel two has a longer one. Each channel can be run separately or can be linked. The unit has reverb phase and low cut filter switches, as well as, input sensitivity, overload indicator, mix and output level controls for each channel. The circuit features an innovative design that for the first time keeps the frequency response of the drive and receiving transducers flat and the noise is lower than ever. The inputs and outputs are fully balanced, three-pin or TRS, using Analog Devices 2142 and 2143 audio devices. The power supply is fully regulated at plus or minus 18 volts for maximum head room and quick transit attack and it uses a custom built, shielded, toroidal transformer for low noise. Each Accutronics reverb tank is individually shielded with mu metal to reduce noise from stray magnet fields. Only the finest components are used for the highest quality reproduction. Now featuring a brand new power supply, 6db quieter than previous versions!